New color palettes can be created in TwistedBrush Pro Studio. 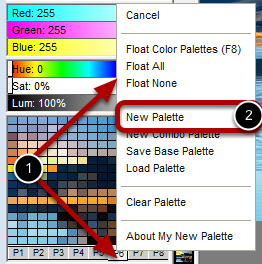 You can either Clear or Edit an existing palette that is loaded already. The palette in any of the palette tab slots will automatically be saved. However, if you want to save your palette by name for later retrieval from the Load Palette dialog that is also possible and shown here. Edit the palette. 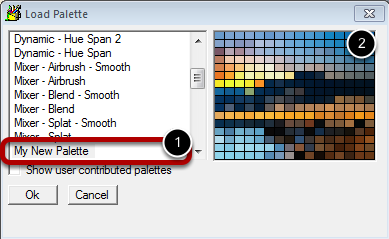 See other topics for how to edit a palette. In this case it was sampled from a photo. 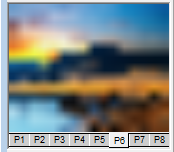 Right click on a palette tab. Select New Palette from the popup menu. Enter the name of the new palette. This is the name chosen in step 2. The preview of the new palette. 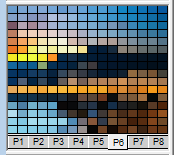 If the palette name entered had been suffixed with the string "- smoothed" the palette will be a smoothed gradient palette as shown here.